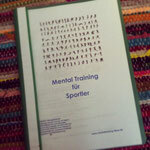 Fleißig am Bearbeiten meines Scripts zum Workshop Mental Training für Sportler. Hello, I read your new stuff on a regular basis. Your humoristic style is witty, keep doing what you're doing! Hi there would you mind stating which blog platform you're working with? I'm going to start my own blog soon but I'm having a difficult time making a decision between BlogEngine/Wordpress/B2evolution and Drupal. The reason I ask is because your design seems different then most blogs and I'm looking for something unique. P.S Apologies for getting off-topic but I had to ask! An outstanding share! I've just forwarded this onto a colleague who has been doing a little homework on this. And he in fact bought me dinner due to the fact that I found it for him... lol. So allow me to reword this.... Thanks for the meal!! But yeah, thanx for spending some time to talk about this issue here on your web page. It's a pity you don't have a donate button! I'd most certainly donate to this brilliant blog! I suppose for now i'll settle for book-marking and adding your RSS feed to my Google account. I look forward to fresh updates and will talk about this website with my Facebook group. Chat soon! Hi my family member! I want to say that this article is awesome, nice written and come with almost all vital infos. I'd like to see more posts like this . Quality articles is the important to be a focus for the viewers to visit the web site, that's what this site is providing.